Hummingbirds are a thrill to watch! Their brain is about the size of a BB. Their nest is constructed of plant down, spider webs, lichen & tree sap. They eat about every 10 minutes. Their long tongues aid in nectaring. Their hearts are larger proportionally to their body than any other bird or mammal. distinctive features of these birds. concentration of nectar from different flowers can vary. 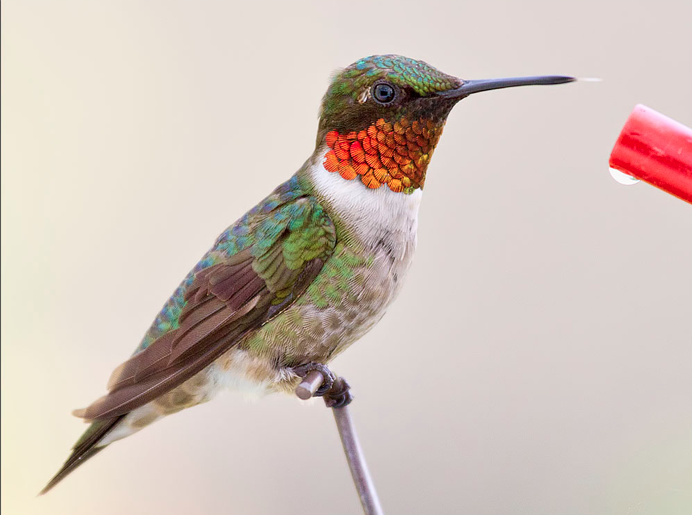 They love a nectar feeder filled with fresh sugar & water solution ~ no red dye please! Combine ingredients in a saucepan and bring to a boil. Allow sugar to dissolve and remove from heat. Let the nectar cool and then pour it into your feeder. Store remaining nectar in the refrigerator.